Paris – 02 December 2015: The Climate Vulnerable Forum (CVF) today acknowledged the declaration of support from Germany and France for strengthening of the 2 degrees long-term UNFCCC goal to the safer below 1.5°C goal at the UN Climate Conference at Paris (COP21). Recognizing this change of position, now 108 countries have clearly voiced support for the 1.5°C target, including the first major developed economies. The move echoes rapidly growing support voiced by states and global civil society for the calls of the CVF’s Manila-Paris Declaration on long-term temperature and mitigation goals. On 1 December, the momentum was highlighted when the Forum was given the rare “Ray of the Day” international award, followed by expressions of support for 1.5°C by celebrity activist, Mark Ruffalo. “The dangers we face at less than 1 degree of warming remind us of the inadequacies of the current 2 degree target and the need for a long-term mitigation goal to guide strengthened party contributions consistent with the most ambitious but feasible target of 1.5°C. We invite countries and civil society groups alike to declare support for limiting warming to a maximum and strongly encourage engagement with our #1o5C campaign [www.1o5C.org]. Join us in fighting for the right to survive and thrive,” said Secretary de Guzman. The Special Procedures report on human rights and climate change is under active consideration by the formal 2 degrees goal review process since June this year. The UNFCCC 2013-2015 Review of the existing temperature goal of 2 degrees is scheduled to hold a final session today at the Paris talks and refer its 3-years of work for consideration by the Conference of Parties. The call to strengthen the current temperature goal was central to the Manila-Paris Declaration the Forum released on 30 November 2015 at the Forum’s third ever High-Level Meeting in Paris. 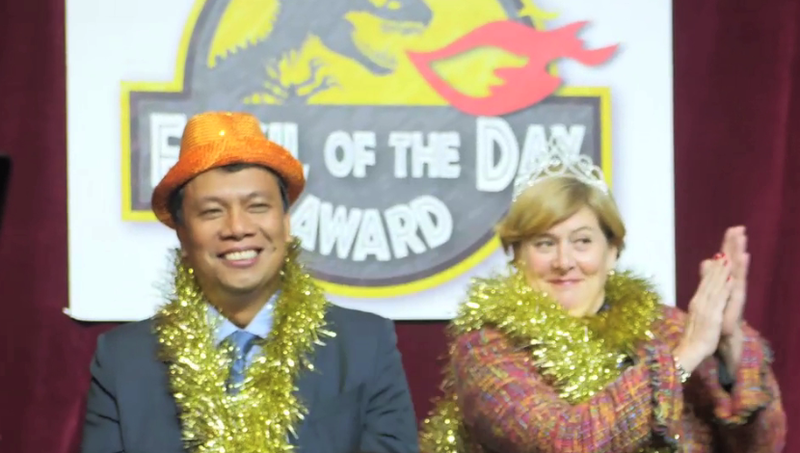 Photo caption: Climate Vulnerable Forum delegates from Philippines and Costa Rica receiving the CAN International Ray of the Day award on 01 December 2015 at COP21 in Paris – source: CVF – license: all rights reserved.